Over the years we’ve learned that although an occasional injury is inevitable a large percentage of the injuries suffered by martial artists, especially injuries involving the sinews (ligaments and tendons) are often preventable. Like the other so-called “blood sports,” the inherent risk of injuries from sparring and the physical demands of daily training make an occasional injury an unavoidable consequence that is more or less considered an acceptable part of the journey in an effort to master our art. Be that as it may, the number of injuries and the training time that’s lost during recovery can be dramatically reduced by doing three things: 1) adequately warming up before stretching, 2) devoting a proportionate amount of time to stretching compared to the amount of time spent performing kata, practicing combat techniques, and sparring, and 3) making regular massage a part of your training regimen. Stretching, which stimulates the production of synovial fluid and lubricate the joints, increases the body’s flexibility which is a major factor in the successful performance of a wide range of disciplines from archery, to ballet, to martial arts. Unlike students of the other disciplines, far too few martial arts practitioners truly recognize the benefits of stretching. Most marginalize its importance and pay a disproportionate amount of attention to strength training, cardio-vascular fitness, and perfecting combat skills. In both classical dance as well as the martial arts our bodies are our instruments and a common goal of both disciplines should be the development of optimal flexibility. In the art of dance and likewise in the art of war the practitioner is encouraged to become as limber as he/she is capable of in order to improve the performance of their art, and reduce the risk of injury. 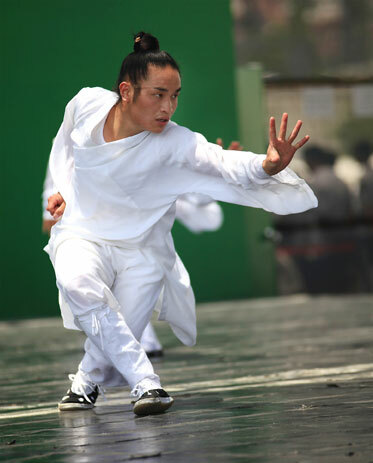 Practitioners of Chinese martial arts have always recognized the importance of making their bodies subtle and flexible in order to become proficient in kung fu and minimize the strains, sprains, and contusions that are an inherent part of training. A key component of their injury avoidance strategy is the attention that is given to attaining maximum flexibility by following a well- designed systematic stretching regimen. To insure that optimal results are obtained there is one important point that needs to be emphasized. According to some of the most highly respected athletic trainers and martial arts instructors the idea that stretching is part of the warm-up is patently incorrect. According to these experts the warm up and stretching are two entirely separate events! If the experts are to be believed two common errors in the training regimen of many martial artists is the minimal amount of time that is devoted to stretching, and an unwillingness to postpone stretching until the body is sufficiently warm. There is unanimous agreement among these fitness gurus that stretching should always be preceded by a warm up in order to elevate the body temperature and improve connective tissue and muscle extension by increasing the circulation of blood and Chi. When proper attention is given to this seemingly minor detail not only will it decrease the severity of an injury if one occurs, more significantly it can reduce injuries by as much as 60-70%. All that said, a high number of martial art injuries involve sprained, strained, pulled, twisted, or torn ligaments/ tendons and if you have a torn ligament, pulled a tendon or muscle, the following formulas are very effective in providing pain relief, healing the injury, as well as strengthening the tendons to prevent further injury. Usage for a minimum of 60-days is recommended for these formulas. This extremely effective herbal prescription is sold in two sizes—choose from—one herb kit (which co.. This is an extremely powerful healing formula that is available in two sizes—choose from—one her..